This new issuance is a cheerful and romantic continuation of the U.S. 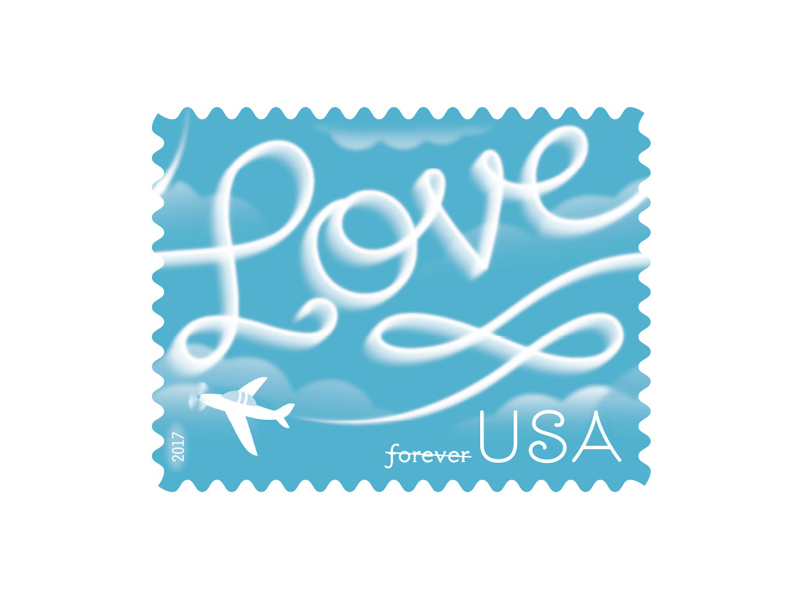 Postal Service® tradition of creating stamps that celebrate love. The Love Skywriting stamp will add a sweet, romantic touch to your letters and cards, not only on Valentine’s Day, but all year round. The stamp art depicts the word “Love” written in white cursive script against a blue sky studded with wispy clouds. The edges of the letters are just beginning to blur into the surrounding sky. Underlining the word is a decorative swirl of smoke that emphasizes the message. A small, stylized plane, dwarfed by the giant letters, completes the end of the swirl, with smoke trailing from its tail. Skywriting had its heyday as an advertising medium from the 1920s to the 1950s, promoting everything from soft drinks to bikinis. Messages are created by a small airplane that emits vaporized fluid from its exhaust system to form letters in the air. Still used occasionally for advertising slogans, skywriting more commonly broadcasts romantic-and very public-declarations of love. Love Skywriting is appropriate not only for romantic correspondence but also for sending letters to friends, to family, or to anyone you love.